Taking a road trip is a great way to see our Great Southern Land. Whether it’s stunning waterfalls, expansive deserts, or over 25,000kms of gorgeous Australian coastline – there’s always something amazing or beautiful to see. But there is another, much quirkier, sort of sight to see when you hit the road. From oversized marine life, to giant produce, and a 20ft bushranger, here’s our rundown of Australia’s Big Icons. One of Australia’s favourite, and most famous, big icons is The Big Banana, located in Coffs Harbour, New South Wales. Built in 1964, and set amongst a banana plantation, it was one of Australia’s first “big things” and began it’s life as an advertisement for a nearby banana stand. Now an nation icon, it now receives over one million visitors a year. The Big Banana now stands at the entry to a theme park that features a number of family friends attractions, such as a downhill toboggan ride, an ice skating rink, a water park and the World of Bananas educational experience. Banana plantation tours are also available. Click here to plan your trip to The Big Banana. 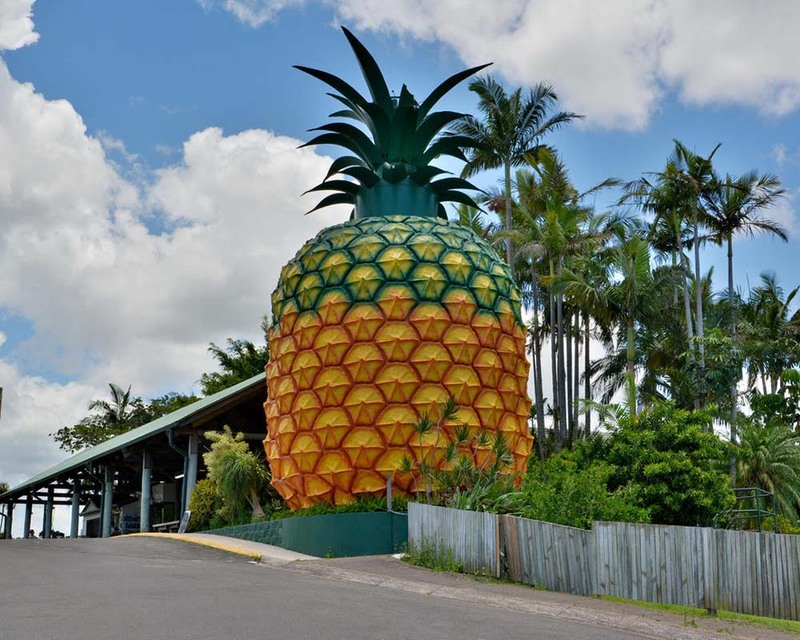 Speaking of large fruit, Queensland has it’s own roadside attraction in The Big Pineapple. Located in Woombye, on the Sunshine Coast, the Pineapple was built in 1971 to draw tourists to the region, where pineapples and macadamias were the primary agricultural produce. Since its humble beginnings, it has found a place in the hearts of many Australian and overseas tourists, who have fond memories of road trips up to Brisbane that always included a family photo along the way at The Big Pineapple. These days, a visit to the Pineapple can also include a ride on the heritage listed Pineapple Train that winds through the steep and stunning rainforest, orchids, and bamboo forest that surround the region, and also stops at Wildlife HQ – a wildlife attraction featuring native and exotic animals. Tickets to ride the train are $5 per person, and kids under 3yo ride free, making this a very affordable and family friendly day out! Read more about The Big Pineapple here. Located in Kingston SE, in South Australia, The Big Lobster is one of the quirkier Big Icons on our list. A local lobster fisherman from the coastal town, known for its seafood industry, commissioned the Lobster to be built as a means of attracting tourists to the local visitors centre back in 1979 – and it has certainly done it’s job, making a name for itself worldwide and even scored a visit from radio duo Hamish and Andy. The Big Lobster certainly makes a great and unusual backdrop for a family photo, and is definitely worth checking out if you’re traveling on the Princes Highway through South Australia. Built in 1985, and standing 15.2 metres high, 18 metres long, and weighing an impressive 97 tonnes, The Big Merino, in Goulburn, New South Wales is an impressive sight to see. Originally constructed to celebrate the regions fine wool industry. Modelled off a famous stud ram of the time, Rambo, The Big Merino now houses a gift shop and a permanent exhibition from Australian Wool Innovation, depicting the 200 year history of wool in Australia. The gift shop has a wide range of woolly goodies, such as Ugg boots, sheepskin throws, fine wool scarves, and plenty more. Check out their website here. To say Ned Kelly is a household name in Australia is an understatement. The famous bushranger and folk hero has been immortalised on film, in award winning books, through song, and in the 6 metre statue that stands at Glenrowan, Victoria – the site of the Kelly Gang’s final, bloody showdown with police. The imposing statue, adorned in Kelly’s famous home-made armour and coat, is just one feature of the Glenrowan heritage precinct. Other attractions include the Ned Kelly Museum, a blacksmith and armoury, gift shops, and plenty of places to wine and dine. You can check out more here. Australia is a big country, so when you’re next out on a big adventure, check out some of Australia’s Big Icons – and what’s a road trip without an awesome road trip play list? Check out our 15 favourite road trip tunes to get your playlist started!